We’re huge fans of slime in our house! But this mom is not a fan of Borax. Most slime recipes use something like Borax, saline solution, laundry detergent, liquid starch, etc. You have to figure out which ingredients you’re comfortable with. Learning how to make slime without Borax is easy to do! We’ve got the basic recipe for you! 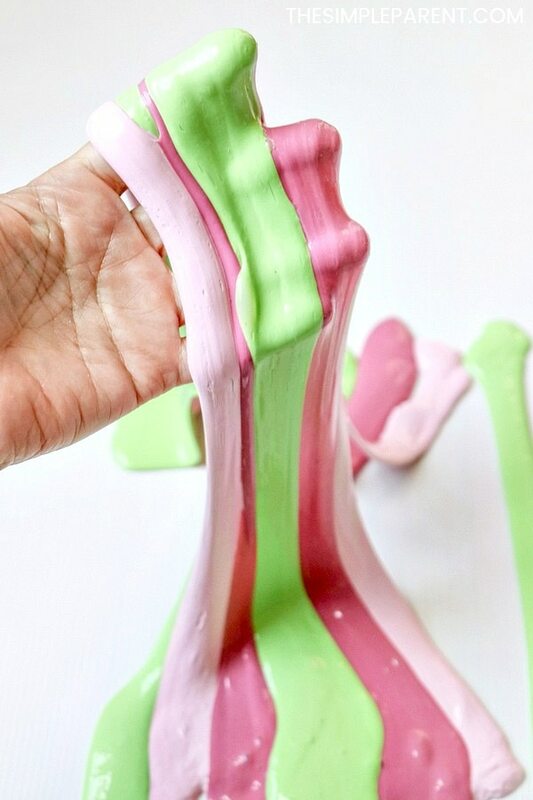 It’s a pretty fool-proof recipe (there’s just one step you need to be careful with) and you can turn this basic DIY slime into all sorts of slime including multi-colored, glitter, and more! As I mentioned before you’re going to end up having to choose something to pair with your glue to turn it into slime. I’ve tried Borax and it’s just not as user-friendly as liquid starch. I feel like liquid starch is easier to work with, especially when the kids are helping out. I need a slime recipe that is hard to mess up. Liquid starch slime is that slime for me. We used it to make this pink and green slime. But we also use it when we make fluffy slime like our pink fluffy slime! So if you need a basic slime recipe, I highly suggest trying our slime recipe without Borax! Because we’re making a striped slime with this recipe, we have to divide the ingredients up a bit. But you’ll still need the basics: white glue, liquid starch, and paint in your desired colors. We sometimes use food coloring too. 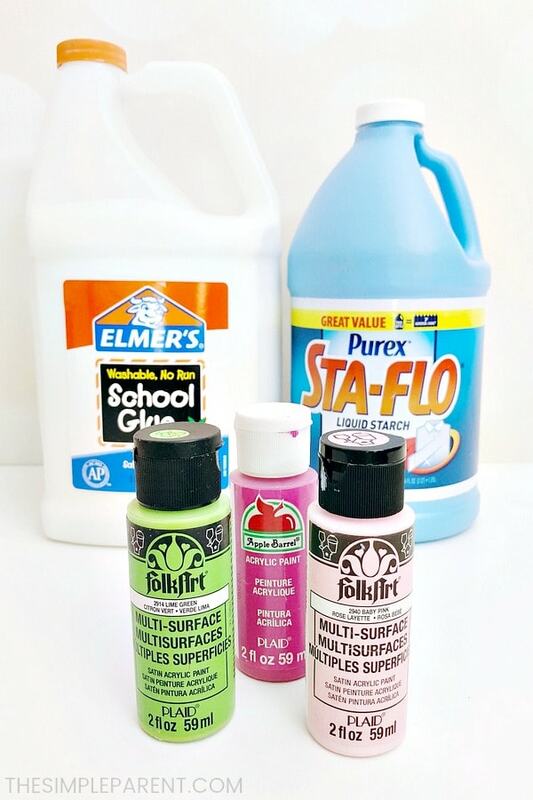 Both work well for making slime with very vibrant colors! 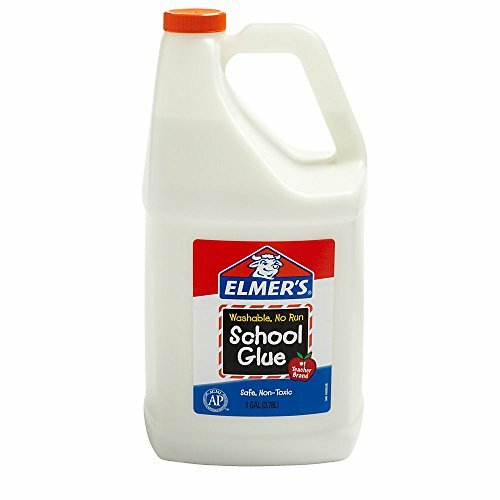 You can buy small individual bottles of glue, but I find it’s a lot easier to stock up and snag a big bottle. We order our glue and liquid starch on Amazon because it makes it easy! I’m all about easy! If your kids love making slime, I definitely recommend buying the big bottles. The small ones just run out so quickly. The liquid starch can be hard to find in stores too. So Amazon to the rescue! 1. Pour 1/2 cup of glue into each bowl. 2. 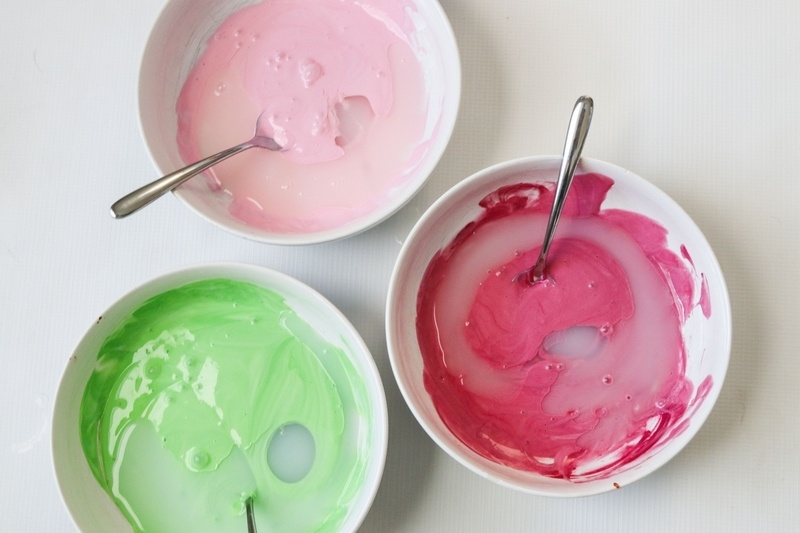 Add a few drops of green paint to one bowl, light pink to another bowl, and dark pink to the third bowl. 3. Stir each bowl of glue until the color is even. 4. Starting with one bowl of colored glue, add 1/4 cup of liquid starch, and stir. The glue and liquid starch will start to thicken it up and form a ball within 15-20 seconds or so. This is the step where you can make an easy mistake that will ruin your slime. Go easy on the liquid starch. You don’t want to add too much at once and make your slime too stiff. So start with less so you feel comfortable. You can always add more if your slime is too sticky. 5. Then use your fingers to start kneading the slime. Push and pull it back and forth between your fingers, roll it, stretch it. It will start out very wet but as you continue to knead the slime it will get less sticky. You’ll have to knead for a few minutes before it starts to really take form. You can also dip the slime back into any liquid starch left in the bowl if it’s too sticky. 6. Continue stretching it between your hands, almost like taffy, until it unsticks. Then put it back in the bowl. 7. Repeat the process with the remaining two colors until you have liquid starch slime in your three colors. 8. Take a bit of each color of slime and stretch into stripes. Lay them out on the table and roll from one side to roll them together without mixing them at first! 9. 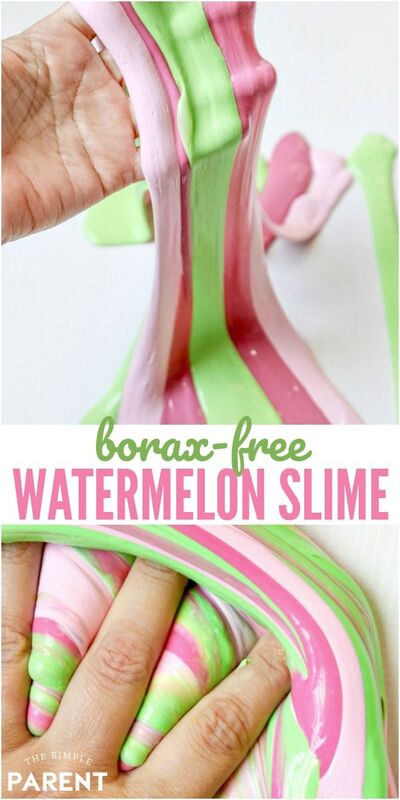 Then have fun playing with your pink and green watermelon-inspired striped slime! You can let it drip through your fingers, stretch it, twist it, and see what happens to all of the colors! As you play with your striped slime, the colors will eventually mix and become one color. It’s fun to predict with your kids what color that will be. Mine always guess brown but it’s not always true! 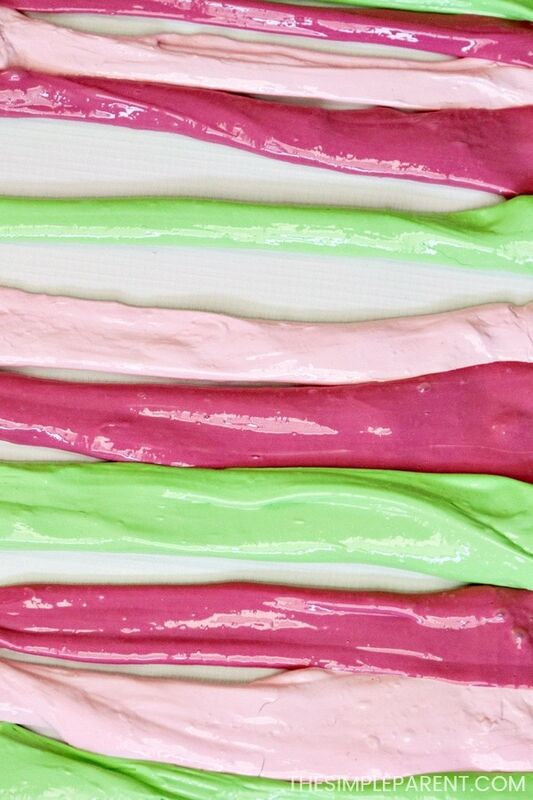 The great thing about this paint slime recipe is that you can do make it with any colors that you want! I’m thinking that shades of pink or even pink with some white would be perfect for Valentine’s Day. Red and green for Christmas, blue and white for winter, greens for St. Patrick’s Day, and the list goes on and on! Learning how to make slime without borax is one of the best things you can do for your slime loving kids! If you love the vibrant colors, learning how to make slime with acrylic paint is a bit of a game changer too! The color possibilities are really endless! For more slime fun, check out all of our slime recipes! 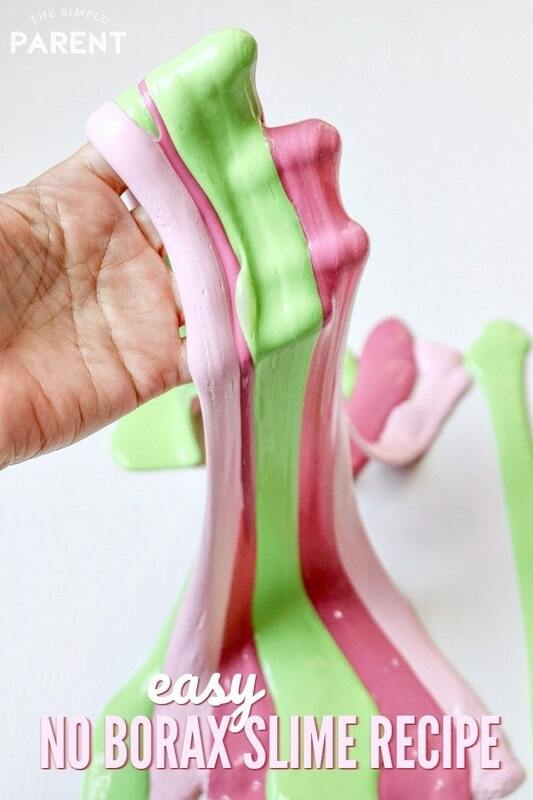 PIN THIS SLIME RECIPE WITHOUT BORAX BY CLICKING BELOW! « Keeping Cool with Frozen Lemonade Slushies All Summer Long!